Cristalli di ghiaccio e neve disegneranno il profilo delle Dolomiti del Trentino nel cielo della Val di Fiemme. 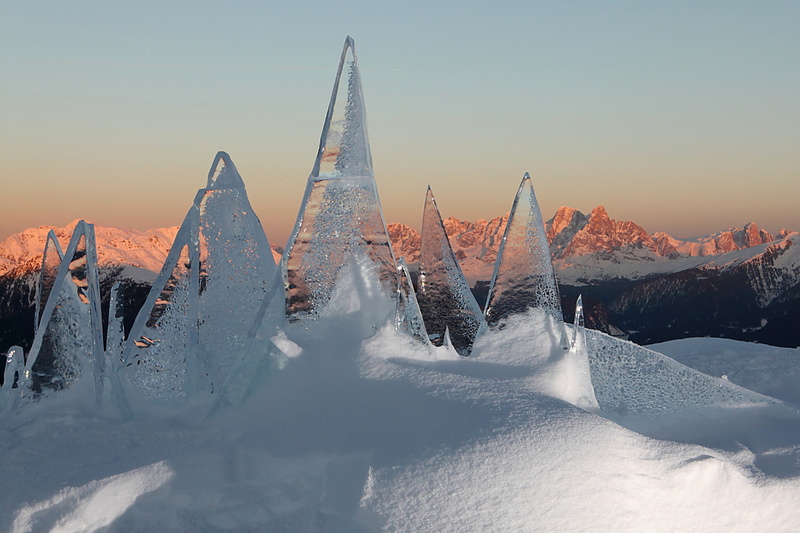 L’installazione artistica di Marco Nones “Ice Skyline” prende forma a Pampeago, sulla pista di sci Tresca, per aprire un sipario artistico sui Campionati del Mondo di Sci Nordico Trentino Fiemme 2013. Suno infatti le Dolomiti del Trentino, riconosciute dall’Unesco “Patrimonio Naturale dell’Umanità”. l’incantevole cornice di questi Mondiali. Ogni inverno e ogni estate la manifestazione RespirArt Pampeago “Green White Gallery” libera opere d’arte nella natura verde o innevata. “Ice Skyline 2013” è patrocinata dalla Fondazione Dolomiti Unesco e dalla Provincia di Trento e promosso dagli impianti di risalita Itap di Pampeago, in collaborazione con La Sportiva di Ziano. Le fotografie dell’installazione di questa opera d’arte, in grandi dimensioni, saranno pubblicate su un volume di 112 pagine curato da Beatrice Calamari con la collaborazione del fotografo Eugenio Del Pero. L’opera, completata il 20 febbraio 2013, sarà visibile fino alla chiusura dei Mondiali (3 marzo). La durata dell’esposizione sarà decisa dal Sole. Ovvero dal tempo che il suo calore impiegherà a dissolvere la creazione di ghiaccio. RespirArt segue, infatti, la filosofia della land art che affida i suoi gesti creativi alla continua trasformazione della natura. Ice Skyline sorge poco più in alto del Teatro del Latemar, ora completamente innevato. Il teatro e le altre opere d’arte lungo il percorso RespirArt sono ammirabili dala primavera all’autunno. (www.respirart.com – http://www.marconones.com – http://www.latemar.com). Each winter and summer, the art event RespirArt Pampeago “Green&White Gallery” creates wonderful works of art right in the middle of the green or snowy landscapes of Val di Fiemme. “Ice Skyline 2013” is sponsored by the foundation «Fondazione Dolomiti Unesco» and the Autonomous Province of Trento, and it is promoted by the ski-lift and cableway company Itap of Pampeago, with La Sportiva. 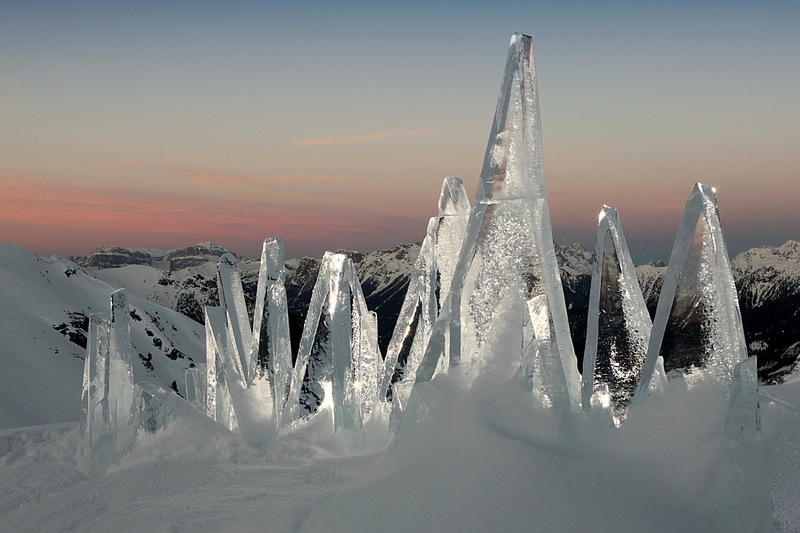 The art installation will be on display on the ski-slopes of Pampeago until March 3. The exact lasting time of the exhibition will be decided by the sun, according to the temperatures and the weather that will decide when the the ice and snow of the slopes will melt. RespirArt follows the principles of land art and its masterpieces are continuously transformed by Mother Nature. Ice Skyline is placed only few kilometers away from another art installation of Marco Nones, the Latemar Theatre (currently completely covered by a deep layer of snow, but still visible right in front of Baita Caserina). The theatre and the other showpieces of the RespirArt exhibition are on display from spring to fall. Among the guests of the exhibition of RespirArt scheduled for next summer (July 8 through August 4, 2013), one name jumps to the eyes: the name of the Japanese artist Hidetoshi Nagasawa, one of the most famous artists in the World. RespirArt Pampeago Green&White Gallery is an exhibition that develops during the year. It is green as the meadows and woods of Pampeago and it is white as it its endless white plains. The showpieces created for this exhibition are made «in Nature and for Nature»: completely created by using natural materials like wood, rocks, leaves, snow and ice. Curious about the results? Just pay a visit to Baita Caserina and have a look at the photography exhibition of the showpieces made for RespirArt 2011. Starting from 2012, RespirArt is a no-profit association. GREEN GALLERY: Every summer, in the open air art gallery that reaches the mountain lodge «Baita La Bassa» (path 514), it is possible to find new art installations, sculptures and land art masterpieces. WHITE GALLERY: During winter, along the «Tresca» and «Agnello» ski-slopes of Pampeago, artists create showpieces only by using ice and snow.